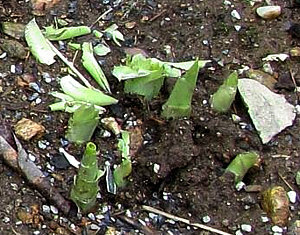 When the tips of hosta shoots finally break ground and head for the sky while crocuses bloom they can come under attack from a number of pests. Rabbits and chipmunks bite off the tips, causing malformed leaves that sometimes can't unfurl. Frost can also destroy the above-ground parts of the shoots. People and animals often step on the newly emerging shoots as well. All of these problems if not seen at the time lead to mysteriously deformed leaves once they've unfurled. Damage done to the plant this early, while unsightly, does little harm to the plant and needs no treatment other than removing destroyed leaves. In the Garden: Moth flakes (not balls) made with naphthalene are EPA-approved in the US and generally safe around pets and wildlife. They are very effective at deterring rabbits and other animals.